Here's a bonnet pattern (guidelines/instructions/tutorial) that I made up after making several bonnets using patterns in my earlier days of re-enacting. What I really wanted was instructions on how to craft my own bonnet without needing a physical pattern. So, if you want an authentic pattern, look elsewhere, but if you want something that will work, and where you don't need to go buy a pattern, give this a try. Easiest: Elizabeth Stewart Clark's slat bonnet. 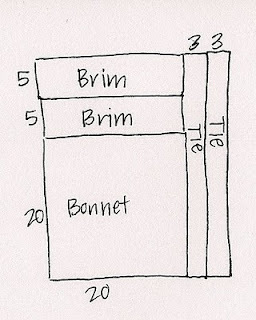 Easy: Sarah Jane's Victorian Sunbonnet (with multi-sizes here) (and pdf of her tutorials here). Slightly more tricky, but do-able: Godey's Lady's Book 1857 Sun Bonnet (with more sizes here). [IMPORTANT!]. I'm finding that if you measure your head and subtract two inches for the measurement for your main square, that measurement is a good size for your bonnet.
. For 16" bonnets, use 6" elastic.
. For 17-19" bonnets, use 7" elastic.
. For 20" bonnets, use 8" elastic.
. A 19" square seems to work well for 19.5" - 20.5" heads.
. My friend's girl has a 19" head and she looked great in an 18" bonnet.
. My baby has a 17" head, and a 16" bonnet is just a tiny bit big.
. My head is 22", and a 20" square looked good. · For a baby doll a 9” starting square works well (see layout below). 1. Cut a square of fabric. In this example, we’ll use a 20" square. 2. 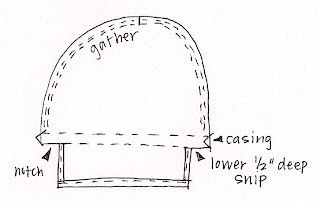 For the brim depth, use ¼ (or slightly less) the bonnet length plus the bonnet length for the length of the brim: 5” x 20”. 1. Fold the bonnet piece in half, and then in quarters (to make a 10” x 10” square). Press to mark a plus sign in the fabric. 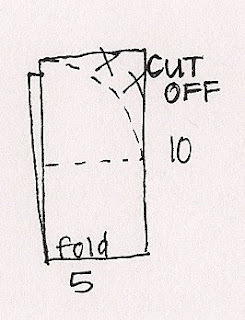 Unfold the fabric one time so it is still in half (see drawing). a. Cut a quarter circle off the top half of the folded fabric. 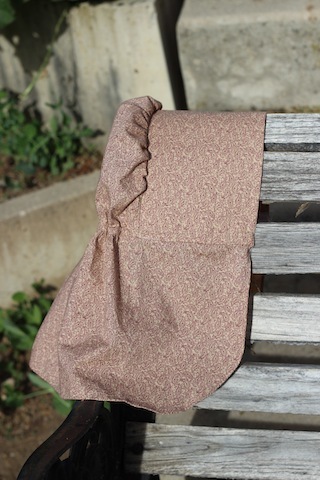 Look at the pictures below to see how you can fold the fabric to make a nice cut. I learned that from The Workwoman's Guide! b. Cut a ½” deep mark 1/5 the way up from the bottom of the fabric: in this case, 4”. Cut another small mark ¼” deep 1” above the first mark. Sorry, I forgot to take a picture of this! c. Mark the top center of the bonnet piece with either a pin or a ¼” snip. 2. Take one brim piece and fold in half two times to end up with a 5” x 5” square. Press to create lines. Unfold once. a. Cut a quarter circle off the top half. Cut the second brim piece to match. b. Cut a piece of interfacing to match your brim. 1. Below the bottom slit marks on both sides of the bonnet, fold the fabric in ¼”, then again ¼”. Press. Stitch. a. Fold up the bottom edge ¼”, then again ¼”. Press. Stitch. b. To make casing, fold top slits down to meet bottom slits in a “Z” shaped fashion. Press. Stitch bottom and top of casing (leaving ends open). c. Cut a 7” piece of elastic and feed through casing. Be sure and stitch ends down. 2. Take one brim piece and fuse or sew interfacing to wrong side. a. Take other brim piece and fold straight edge ½” to the back (wrong side). Press. b. Stitch the two brim pieces right sides together along the curved edge with a 1/2 “ seam. Trim to ¼”. Clip and notch curves. Turn. Press. c. Mark with a ¼” deep clip the center of the straight edge of the brim (or use a pin). 4. Run two rows of gathering stitches from one side just above the tie around to the other side just above the tie. Gather bonnet all the way around. 5. Pin straight edge of brim (unfolded piece) to bonnet, right sides together matching centers and brim ends with notched ends of bonnet. Baste with a ½ inch seam, being careful not to catch the second piece of brim (the one that was turned ½” down). Stitch, ½”. For a (printable) PDF of this tutorial, click here. The Idea Door also has a few links to patterns. One link doesn't work anymore, another goes to Mother Earth News (but there are no pictures), and I did try the last link entitled Women's Pioneer Bonnet (.pdf), but can't remember why I never finished that one. I tried this pattern also, but it turned out kind of funny. You know, had I known that on-line patterns were called tutorials when I made this pattern, I would have just Googled for a bonnet tutorial like this one from Given Moments in the first place. Here's another tutorial from Pickup Some Creativity. Hey! If you try my pattern, let me know how it goes! I'd love to know what sizes of fabric work for what size of head. Thanks for including mine...it may not be completely accurate time-period wise, but it looks like it could be! Have a great day. So cute ... I will try to make one ! I am going on a trek in two weeks and left getting the clothes together until the last minute. I am not very good at sewing, but this pattern is really easy to follow and I love the bonnet! I am 14 and have a 22" head. I am making the 20" bonnet. Thank you! I tried the odd one that you have the link to as well. Did you wind up with an oddly shaped bonnet that just flopped at the brim?? This particular pattern has been my nemesis for about 2 years now. I thought I knew my sunbonnet patterns but thing is just ridiculous. I wish I knew where it was from, if it's Godey's, Petersons, Harper's, who? It looks about 1860's (in my opinion anyhow)then maybe I could hunt down some instructions! Jaie - yeah, let me know if you ever find out. I'm curious! Thanks for these instructions - I'm going on a class field trip to re-enact the Oregon Trail and this will be perfect for the 'interpreters' along the way! Hi! Thankyou so, so much for this pattern!! I can't believe how easy it was! I've always wanted to make a pioneer bonnet, and now I've finally made one.. I'm so excited! The pattern was very easy to follow; I made a 18" bonnet which fits my 5 year old sister very well. Thanks again! Thanks so much for the super easy and super cute pattern!! I made a 20" bonnet and it fits exactly how I want it to. And, it only took a couple of hours to make the perfect bonnet for my Halloween costume, the Sun Maid Raisin girl! :) Thank you again! Thanks a million for this pattern. I've been searching for weeks and had almost given up finding one on the internet, when I stumbled on this one. I made a 19" bonnet for my 9 year old daughter...pioneer costume for Halloween. It turned out great. The directions were easy to follow. Thanks! I'm just tickled pink that you are all liking this pattern. I'm glad it is working out for you, and I'm also glad you're leaving what sizes you are making! Glad to be helpful! I've made THREE of these today. Love, love, LOVE this pattern. Very easy. Really does only take two hours, maybe less once you get going. The first one I made was HUGE.... I think I over estimated the size. It would fit a professional football player's head, I'm sure. The other two I made were perfect. One I made from old flowered sheets for my four year old daughter is unbelieveably precious on her. Thanks for posting this. Its going to be a big hit at girl scout daycamp this year... pioneer theme. I'm so happy I found this tutorial! I made two bonnets today for my 4 and 6 yr old. They have a Laura Ingals themed b-day party tomarrow. So I whipped out two easy skirts and bonnets to match. So Adorable! I have to admit that I'm at a basic level when it comes to sewing but your pattern was easy to follow! My only question was why did you hand sew at the end? I pinned the folded edge making sure the unfinished edge was in between the brim and threw mine in the machine to finish it up and it turned out great. Also I may have adjusted the length of the ties for my girls as well perhaps a little shorter. I made the hats 18" for their 19 1/2" heads, I also made one with a slightly narrower brim and it looked great as well but won't give as much sun coverage as the wider brim. Thanks again for the awsome tutorial! I'm telling all my friends at the party tomarrow! Hey Emilie -- I guess I just finished it that way because that's how my mom always finished the inside of things! And, I've noticed, that's often how you finish on the inside of reproduction garments. So, although the garment isn't really "period" appropriate, I guess some of the technique sneaks in? The way you did it works great, too! I sometimes finish the way you mention, too, but find if I don't line it up just perfectly then I'm not happy with the results. Hope the party goes well! Thanks sooo much for posting this tutorial. I needed one last minute for a school project my daughter is doing and this was perfect! No running to the store to buy one or frantically calling friends to try and borrow one. It took some figuring out but I am happy with the result! I'm sure my other daughters will want one now too! Thank you, thank you, thank you! I'm in Australia and my little girl has an old-fashioned themed dress-up day at school tomorrow. Your instructions were SO good! I am not a skilled sewer by any means but I whipped up at bonnet in two hours and she's going to be thrilled when she sees it tomorrow morning. I made a 18" square for a 7-year old head and it looks the perfect size. I suspect she's going to love this bonnet so much that it'll be worn a lot more than once. Bless you heaps! Thanks, Deb! Super! Hope she has fun! Thank you so much! The pictures helped out a lot. YOU ROCK! Thank you so much for this! I had tried to sew a bonnet once before without success, but this pattern was easy enough for even an novice sewer like myself could do it. I sewed a 20 inch bonnet for my teenage daughter who had a 21 inch head. It fits perfectly. It took me around 2 hours. My only feedback would be that the ties seem to be a little too long. And I got a bit confused when it came to sewing the two brim pieces together. I turned down the one without interfacing 1/2 inch, but then sewed right across the fold. When it came time to do the hand stitching I realized I couldn't pull it out at the ends because I had sewed it down. I was able to work it out, and if I were to sew another, I'd know better what to do. Thanks again. I've now sewn this bonnet and the skirt on the other page. I think we are now ready for trek. Way to go Becky. Glad you got it to work out! I should add some tie options on there!! Thanks for the reminder. Thank you so much for this easy to follow, simple pattern. Six different people are now wearing these bonnets on Trek this upcoming week. They all look fantastic! Thank you for the awesome tutorial! I managed to whip one up in about an hour and a half for our pioneer activity this afternoon. I will certainly pass along your blog link to others doing pioneer activities! Hello from Brazil, I love things from the american pioners and i liked your pattern, is so cute, i will try to make one for my litle girl.Thank you. Hi! Thank you for the pattern, I couldn't be happier with the results. We are having an old fashioned day at our church and I'm sure everybody will love it. Thank You! You're welcome! I'm amazed at how many people use this! Hi there. I have just made a bonnet using your pattern and instructions. Thanks from me in New Zealand. Linked on my blog. Fabulous, thanks for sharing! Hi,we are catholic and finially baptized our 15 year old daughter last easter sunday at easter vigil.I made her traditional baptism bonnet out of white satin and decorated it with lace around the brim.she wore the traditional white,poofy above the knees.infant style dress with lace anklets and shoes.i was fortunate to find the same lace for her bonnet as was on her dress so the bonnet pretty much matched her dress.the girls normally wear a cloth diaper,rubberpants and under shirt under their dresses.i made her baptismal diaper out of infant diapers sewn together to make one diaper.i then sewed the same lace as on her bonnet around the waist and leg openings of the rubberpants to make them look cuter. I just made this bonnet for my granddaughter and it came out great. I used the 20 inch size for her, she is 10, she is going on a field trip and has to dress in costume. Thanks for the great pattern. I tried another one on the internet and it was a disaster! It would be helpful to the beginning sewers, if you said the brim was to cover the ties, that was the only "hitch" I had. Thanks again. I made this (19")for my granddaughter's fifth birthday. She's going to love it. Can't wait to give it to her on Saturday! Many thanks for your pattern and tutorial,the finished bonnet was so cute. My daughter was going on an "olden days excursion and she looked great thanks to your help! I used your pattern to make a bonnet in bleached muslin for the Women in Science Fair in Manchester, UK. 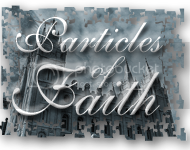 It was for the person portraying Caroline Herchel, the astronomer. I'd love to put up a pic! I just wanted to say thank you for sharing this. My daughter wanted a sun bonnet for heritage days at school and we made one following your directions. It turned out great. It is not perfect since this is the first time sewing anything complicated as this but it does look great! We had some difficulty with the directions in a couple of places but this was due to our inexperience but we figured it out. I used this pattern for my daughters field-trip costume and it came out great! Easy to follow. I didn't understand the instructions to make the circular cuts so I used a pen and some yarn like a compass. Thanks for the awsome pattern. My grand-daughter came home yesterday with a note saying she needed a pioneer bonnet and shawl for tomorrow! I used your pattern and some natural color linen and it turned out just wonderful. Took me 3-4 hours. Thank you so much!! Thank you so much for these instructions!! My bonnet turned out great and the instructions were wonderful! I'm thinking about making another one! Just finished making a bonnet for my niece using your pattern. She's 8 years old and I did an 18 inch size bonnet. It turned out wonderfully. Also, it was fun to learn how to cut the curve on the bonnet and brim pieces using what you had learned from The Workwoman's Guide! Thank you for sharind! I just stayed up until 1am making four bonnets for my girls. They turned out great. Thank you so much for sharing. Happy Pioneer Day! Thank you for your pattern, it was pretty easy to follow and the bonnets came together fairly quickly. I made 20" bonnets for my 6 and 8 year olds and 18" for my 4 year old. They seem to fit well. I sewed it all with the machine because I am lazy and wanted it to be quick but it turned out just fine. I'm so glad I found your tutorial! Hi there! What a great, easy to follow tutorial! 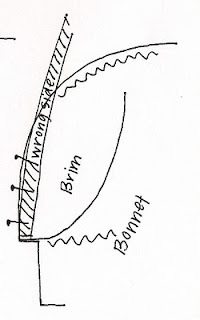 I would like to link to this from one of my pages over at Squidoo when I talk about making bonnets. I was wondering if I could use one of your bonnet images with the link. Thanks so much! My granddaughter wants to be the sun maiden on the raisin box and this bonnet is EXACTLY like the one the sun maiden wears. I just finished making it, and it is AWESOME!! Thank you so much for an fantastic tutorial. She is going to be so excited when she gets it in the mail next week just in time for her school's Halloween costume contest. I bet she wins!!! I want to Thank You from the bottom of my heart for making this pattern, and tutorial. I am a visual person. This was the perfect tool for me! I have always wanted a Prairie Bonnet, since watching Little House as,a young girl. I found your pattern, and had one made in just a couple hours. A dream come true. I made the 20" pattern. It went quickly and I couldn't be happier with the result. Now I want to make one in every color, just to hang around the house. Thanks again! This was sincerely a dream come true! Help pease!? I really liked your toturia, but when I started to make the bonnet with my daughter, well, we immediatly had a problem. When we folded the fabric and used the method you showed to make the rounded off corners, we ended up with a straight angled edge instead. I am not clear on the directions from the photos, so I guess we did something wrong. Could you give us some assistance? Thanks so much! Oh that's too bad! I'm sorry that happened. Try using a piece of paper folded as shown to see if you can get it to do the curved edge (it's similar to when you fold paper for a round snowflake, except in this case you're not making a full circle). Once you figure it out on paper, then you can be sure it will work on fabric. Does that help? You could also just estimate a curve. I've also seen people tie a string to a pencil and make sort of a protractor -- that would also give you a nice curve. Thank you! Just made this for myself as a chaperone for my son's One Room Schoolhouse fieldtrip tomorrow. It's authentic enough for me and your instructions were great. Very fun! I looked over several patterns and watched a few Youtube tutorials trying to get an idea of a pattern and size to use. Your layout and measurements made it all come together for me. I used the basic 20" measurements for the bonnet with 8" elastic, the width of fabric for apron cut at 32" length then hemmed about 4". I think it will be great for most and we can tweak for those who are quite a bit larger or smaller. I wanted a basic pattern to show and use for fitting guide to help a group of girls going on a trek. THANK YOU!! we are catholic,and beleive it or not,our parish requires the little girls to wear a bonnet instead of a veil with their required communion dresses.I used tis same pattern to make her communion bonnet out of white material and used satin ribbon to tie it under her chin.she looked cute in the outfit. Allison - glad to be of help. I'm sure she was adorable! You guys are all so sweet to leave comments! Thank you so much for this pattern! This is by far the cutest pattern I found for my Trek bonnet :) My head is about 22" and I made a 20" bonnet. It fits perfectly, and these instructions were easy to follow. Thanks again! Hi. Thank you for the tutorial. My head is a 24" and so I made the 24" bonnet. I missed the part about subtracting an inch and also used 7" of elastic, so the bonnet ended up huge but fits nicely at the neck. It's really cute, though, and should provide ample protection from the sun! Thanks again! I'm a beginning sewer, and was able to figure this out! I made two for my 13 yr old daughter for Trek. We looked at your instructions for figuring out the size. Her head is 21 3/4" so we did a 20" square. It was GIANT!!! Could've fit a really large hair bun under there :) The second one, we tried an 18" square and it was perfect! She even told me she loves that one!! Hey thanks for the tutuorial - some daft person (me) volunteered to make a bonnet and apron and ride in the chuck wagon on the 4th of July parade. Ha. I just don't know what gets into me! Thank you so much for posting the bonnet! My Mom was having trouble finding one for Old Fashioned Day at Church. Thanks to your pattern and easy instructions she now has a Bonnet and Apron to match. God Bless! This was a good tutorial, my bonnet turned out well because of this. Thank you. My daughters head is 20 1/2" so I used the 19" square with 7" elastic. It fits ok, a bit loose, but I think a 18" square would be a bit tight and uncomfortable to wear for a long time. Just finished a rose pink one for my curly, red-headed 20 month old. It is absolutely adorable. I think I made a few mistakes but it still looks great. I did a 16" square for her and did 4" brims. I like that I can still see her little face pretty well. I used 6 inch elastic but I think I would shorten it if I did it again. I also used some vintage lace ribbon for the ties - so sweet. Thanks so much! Thanks for the pattern. I made an 18" for my 10 year old and it fits beautifully - ready for her to be Laura Wilder in a book parade at school this week. Thanks so much for the great pattern and instructions! I just made this bonnet for my 9 year old daughter to wear for the book fair next week. I made hers 19 inches and it fits well with some room to grow. It is perfect for her Laura Ingalls costume. Thanks again! Hi there, I'm trying out your bonnet pattern, I don't know if you are still checking this post! I'm stuck at the directions to "fold the top slits down to the bottom slits in a "z shaped fashion." I just can't grasp what that means! If you had any input, I would love it, thanks. Hey Lauren, just make a fold from the top left slit to the top right slit, then fold it down to match the bottom left slit and right slit, like you're folding a fan, but with only one fold. Then you're sewing it to make a tube/casing. Or, you could just sew a casing over the general area, too, if that's easier. Thank you so much for taking the time to explain it! I did figure it out...yes the fan analogy is right on! And I just finished my super cute bonnet. Thanks again for this tutorial! I've now made 6 of these, and can get them done in about an hour or less for each one. It's a really adorable and easy pattern once you understand the instructions. I just thought I would share my experience with sizing. I made a 19" for my 10 year old and it's perfect, if not a little on the big side. So the other ones I made (for a Little House party) as a one-size bonnet are 18" with a 3/5" brim, and 18" ties. I think it would fit any girl from about 5-10 pretty well. I'm sure as a real working bonnet you want the brim to be a little bigger, as in the 19" fit on my 10 year old, but as a bonnet that's essentially for fun, my hunch is that a smaller brim is a little preferrable, which makes the sizing on these really flexible. Thanks again for sharing this! I really enjoyed making them. Thank you for this great tutorial! I needed a bonnet for my daughter for Halloween and sewed this in 2 hours! Yay! I was so happy to find your simple instructions with measurements and photos. My daughter is going to squeal with glee when she wakes up. Thanks again Emily! What terrible instructions. Why not take your time, then read your instructions back to yourself as if you have never made the item. You can then go back and make changes where necessary. You had time to undo your brim, sew it the right way and take another photo for the purpose of the tutorial. I used the pattern, love it, just my head is 22" and the 20" I made doesn't have the fullness in the back to accommodate my hair, was a little small for me, though everything else fit fine...so am going to try a retangle shape to get more fullness in the back of the bonnet to accommodate my hair being pulled back in a bun or pony tail. How do you measure the head? around circumference above the ears, or from top or forehead to under chin? Hi, I'm excited to try this bonnet for our Pioneer Trek this winter. I am confused about the ties though - at the beginning you say "There are two brim pieces. One is for the outside of the bonnet, and the other is for the lining. The ties sandwich between the two brim pieces," but later in the instructions you seem to be sewing the ties to the body of the bonnet. Which way is right? I did both just like it said and worked out great. The first one mentioned is kind of holding the ties in place. 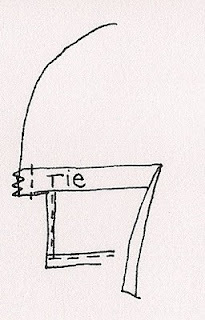 The 2nd is hiding the raw edge and forcing the ties to hang down the way you want. Hey Jenna, yes, the first time you're just basting (holding in place with bigger stitches), the second time you're getting them in there for good. Thanks Imperial! I forget to get back to this blog! And winter trek!!?? I hope you live in a warm place. That would be like Martin's Cove for us here in the cold this time of year! Have a great time! Anonymous up above asked how to measure: measure around your head as if you were wearing a hat (forehead to back of head). she was 6 months. The due to family emergency. I didn't make one the next year in 2017. We had to buy one. I made her an 18" last year. She was 2 1/2. But it was a little big on her. So I made the same size this year. I however don't follow your beginning instructions exactly. I made a pattern on newspaper for the bonnet, brim, and straps. 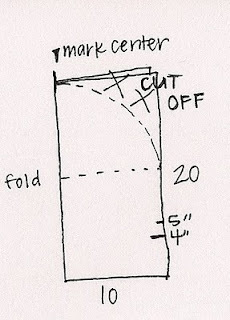 Rather than cutting squares of fabric, and rounding the corners. I haven't tried on this year's bonnet yet. But I think the 18" will fit fine this year. I do also struggle each time, with figuring out finishing the edges from the elastic up to brim area. It's not clear in the instructions. I figure it out each year by zooming in on the pictures. Some additional instructions on this would be helpful.. for me anyhow. I will add that she's won 1st place in the bonnet contest the last 3 years. Fingers crossed for this year. I would attach pictures. But I don't see how. Thanks for sharing your pattern. We certainly have enjoyed it. Update, the 18" was still a little big. However it fit better than last year. I was able to quickly adjust it by tightening it at the back with safety pins. Which had it fitting much better. Next year, I'll have to measure her head. See if she's ready for the 18". Or perhaps adjust the pattern down to 17", or 17 1/2. She won 1st place again again this year. Now 4 years in a row! The general consensus from family and friends. Is it's the adorable bonnets I make her, using your pattern!